Atlanta quartet's newest LP captures the feel of getting behind the wheel and peeling out for parts unknown as the summer sun shines on. Garage rock is an inherently limited style, one that increasingly runs the risk of treading water as the decades roll on. The building blocks of lo-fi vocals, jittery drums, and distorted guitars can only be pushed so far to make a sound that’s still fresh and intriguing. For a band working among these sub-genre trappings, there’s the labor of having to somehow set yourself apart from the indistinguishable deluge surrounding you. 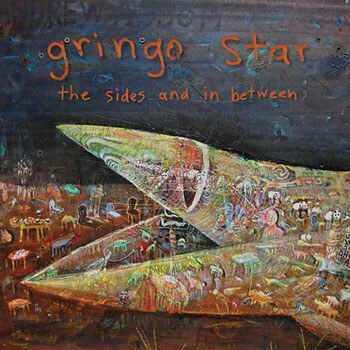 Among those select few who have broken from the constraints is Atlanta quartet Gringo Star, whose fourth LP, The Sides and in Between, masterfully injects energy and sonic diversity into a stagnant template. If you couldn’t tell from their name, there’s a tongue-in-cheek approach with Gringo Star. They have an awareness and fun aesthetic that doesn’t veer into self-parody. This is essential to their appeal, but what keeps their sound novel is the way they infuse it with a wide range of other genres’ flourishes that are atypical for fuzzed-out indie pop. What results is an album composed of 10 songs that aren’t too similar to one another, yet are still linked by a consistent atmosphere. The record is permeated with a sun-scorched feel that makes you want to rent a convertible and go on a desert road trip as the temperatures near the triple digits and the orange mesas fly by. Its sound calls to mind the over-saturated, bleached look of films shot in the American Southwest. The record is pure wanderlust and speaks to the desire to abscond from your current station and travel for the sake of traveling. It’s a travelogue soundtrack through and through, with the lyrics frequently referencing the hitting-the-road theme. The lackadaisical attitude is established from the opening bass rumble and flickering, live wire guitar of first track “Rotten”. The choppy verses build with a steady tension as the loose rhythm becomes tighter, simulating a general malaise reaching its nadir as release beckons. Catharsis comes when the pressure breaks in the elevated refrain of, “Well, it’s the same, slow times / All those same old crimes / And you won’t get much for your dime”, the respite quickly ending as the fissure is sealed back with skittery, surf rock fret work. Elsewhere, the idyllic folk of “Going Home” is a slice of hammock-swaying insouciance. Seagulls’ squawking, a maraca shuffle, and melodious whistling makes one think of Happy/Sad-era Tim Buckley, albeit with less austerity. On initial spins, the tune seems oddly placed in the middle of the record, as it has the feel of arriving at your long-sought destination. In the context of the album, though, it stands as the narrator’s daydream of an arrival point still so far away. On its heels is the aforementioned “Knee Deep”, marking the record’s biggest contrast from song to song. Starting with an acoustic strum, it soon turns ominous as the bass hums and creates the sensation of making your way through a bayou toward a nefarious juke joint. The paranoid feeling is added to by a taut string section that periodically emerges from the morass. In the last third of the record, the trio of “Heading South”, “Undone” and “It’s You” amounts to something of a suite. All three are breezy tunes featuring quirky instrumentation and an abundance of layered melodies. “Heading South”, another ode to the freedom of travel, samples a laugh track interspersed between arpeggios emanating from a mandolin. “Undone” is a slowly drifting meditation with more whistling and a roiling guitar underbelly, somewhat reminiscent of the Brian Jonestown Massacre. “It’s You” is built on a broadly sweeping, controlled wall of feedback, all while piano keys are plinked and the mandolin strings frenetically vibrate. With closing track “The Last Trace”, the band recoups some needed vigor. It chugs with wild abandon, ensuring the record receives an energetic send-off. It doesn’t relent over its two-minute length (the second shortest song here) and while it feels like the journey still has a few miles left, the destination is in sight and an achievement of personal fortitude and realization is at hand. One can see the narrator’s car driving into the sunset as the title card comes up and the image fades to black; it’s a thematic conclusion to the record with a cinematic touch. While it’s not a perfect album, it certainly does its job of capturing the feel of getting behind the wheel and peeling out for parts unknown as the summer sun shines on.